If you live in an area that is placed under mandatory evacuation orders, your local emergency management officials have determined that it is unsafe to weather the storm in your home. Whenever possible, pack up and move your family to safety. Ideally, you will have made arrangements with family or friends who reside outside the danger zone. 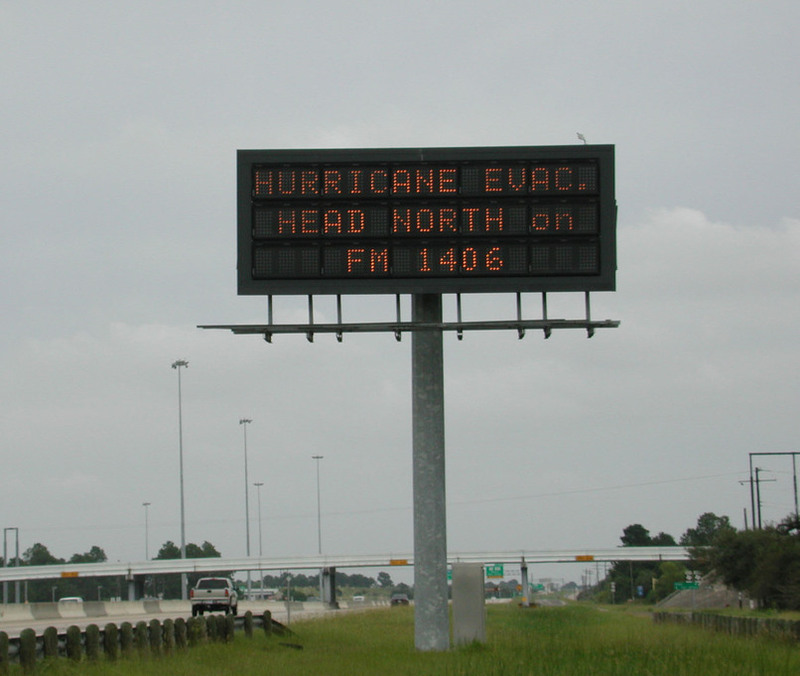 Blue signs are posted to guide drivers to hurricane evacuation routes. When evacuation must occur quickly, the governor may order all lanes of traffic on both sides of an interstate or Florida’s Turnpike to move in the same direction. During emergency evacuations including wildfires and hurricanes, evacuees can call 511 to get up-to-the minute reports about major evacuation routes, road closures, roadway and bridge conditions, and toll suspensions. Always obey mandatory evacuation orders. Stay alert to storm advisories; WATCH and WARNING — Know the difference. Enact your family disaster plan. Map out your route. Use travel routes specified by local authorities. DO NOT get on the road without a place to go. Enact your pet plan. Before a storm threatens, contact your veterinarian or local humane society for information on preparing your pets for an emergency. Bring your disaster supply kit, including important documents (see page 35 for details). Secure your home before leaving. Board up windows and glass doors, anchor loose yard objects or bring them inside and lock your doors. Get cash. Following a hurricane, banks and ATMs may be temporarily closed. If possible, evacuate to the home of either friends or family in a non-vulnerable area within your county. Next try a motel or hotel and as a last resort go to a public shelter. Remember, shelters are not designed for comfort. People who require special assistance in evacuating should register with their local emergency management office. Plan Your evacuation route here.